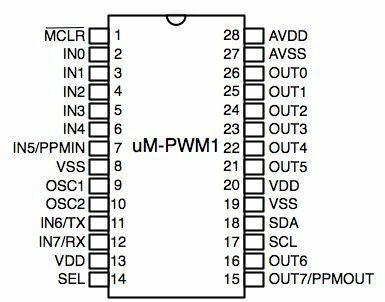 The uM-PWM1 chip is designed to work with pulse-width modulated signals used for remote control servo applications. It provides up to 8 input channels for monitoring pulse widths and 8 output channels for producing pulse width modulated (PWM) signals at either 50 Hz or a selectable frequency from 10 to 450 Hz. It can be interfaced with a microcontroller using an I2C or serial data interface. Functional description and hardware specifications. Return to Top Copyright © 2004-2014 Micromega Corporation. All rights reserved.